Hubbard Street Dance Chicago in Solo Echo by Crystal Pite. Photo by Todd Rosenberg. 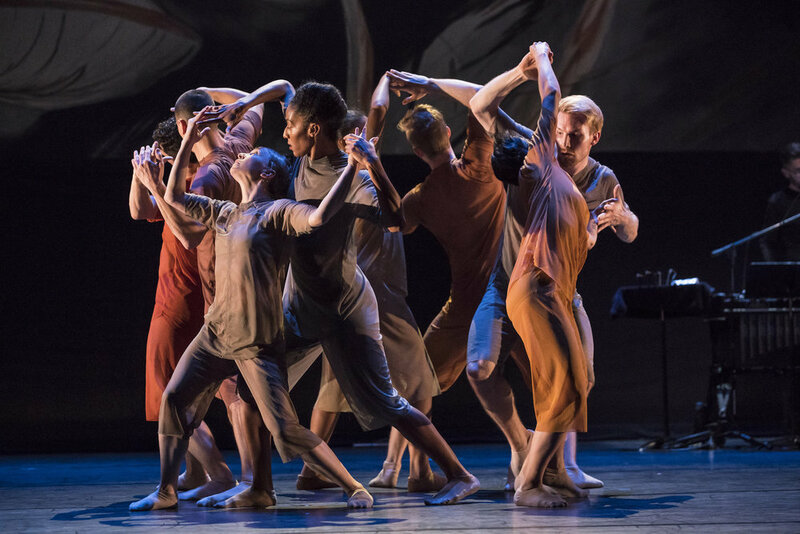 Ahead of its Northern California performances, the highly acclaimed contemporary dance company, Hubbard Street Dance Chicago, and Grammy award-winning Third Coast Percussion premiered excerpts from their collaborative works at Wallis Annenberg Center for the Performing Arts in Beverly Hills from January 10-12, 2019. Third Coast Percussion in Perfectly Voiceless. Photo by Todd Rosenberg. Minimalism in the opening piece seemed reminiscent of Glass, but with a lightness of pop music and this should not have come as a surprise since Hynes is a noted devotee of Glass, performing covers of Glass’s Metamorphosis live on SiriusXM and participating in numerous collaborations with him along with an interview together on NPR. The first half of the program continued with two more original compositions by the NY-based Hynes, all performed with singular excellence by Third Coast Percussion. The first dance of the evening was “For All Its Fury” choreographed by Emma Portner, who gained international attention for video and tour work for Justin Bieber. Portner’s choreography tends to push physical boundaries “to find unknown shapes and capabilities” and could be seen in the fluid, serpentine movements of soloist, Rena Butler. Counterpoint was provided with the often angular, 2-D frieze-like stances of the rest of the dancers who provided the dramatic element of a narrative emphasizing societal oppression. “For All Its Fury”. Photo by Todd Rosenberg. Moving from the tension and darkness of the earlier piece, the 2nd piece “Everything Must Go” also scored by Hynes provided some relief of lightness and optimism with choreography by Teddy Forance whose work has been featured on the hit television show “So You Think You Can Dance” and Emmy-nominated for his work on “Dancing with the Stars.” In contrast to the apocalyptic color scheme of the earlier work, most of the dancers were dressed in dusky pastels, mushroom-like in appearance dancing to a mashup of martial arts and hip hop, ending in movement reflecting back to the mushroom theme. Hubbard Street Dance Chicago in Decadance/Chicago by Ohad Naharin. Photo by Todd Rosenberg. After a 15 minute intermission, the second half of the Hubbard Street Dance Group program began with the excerpt “Ignore” from “Decadance/Chicago” by Ohad Naharin, the former artistic director of Tel Aviv-based Batsheva Dance Company. Five female dancers danced both in unison and in solo pieces displaying the spontaneity and flexibility of movement, which marks the style of Naharin. Set to music by Estonian composer, Arvo Pärt and with spoken word by Bobbi Jene Smith, formerly of Batsheva, the explicit language of Bukowski drew guffaws here and there from the audience. For a change of pace, Alejandro Cerrudo’s “PACOPEPEPLUTO” featured three male dancers, each portraying the characters of Paco, Pepe and Pluto. Set to the songs of Dean Martin who epitomized the 1950’s masculinity of cool, Cerrudo’s choreography began with coy movements of a dancer covering his front side provoking "is he" or "isn't he" whispers from the crowd (actually, he and the other dancers were wearing flesh-colored tighty-whiteys). In a playful defiance of the Charles Atlas ideal of bulky muscles, the juxtaposition continued with dancers often in Mercury god-like flight highlighting their long, lean, and agile movements and the lighting design emphasized their musculature to create pages of a Gray’s Anatomy medical textbook come to life. Hubbard Street Dancer Jonathan Fredrickson in PACOPEPEPLUTO by Resident Choreographer Alejandro Cerrudo. Photo by Todd Rosenberg. The evening’s program closed with “Solo Echo” by the legendary Crystal Pite, Associate Choreographer of Nederlands Dans Theater and Associate Dance Artist of Canada's National Arts Centre in Ottawa. Based on “Lines for Winter,” a poem reflecting on life, loss and death by Pulitzer Prize recipient and former American Poet Laureate Mark Strand and set to Brahms’ “Sonata for Cello and Piano in E Minor.” Mirroring the sonata’s haunting lyrical beauty and gravity, Pite’s style took classical dance pedagogy such as pas de deux, pas de trois and corps de ballet, but brought a freshness with both stylistic movement and non-binary combinations of gender, concluding with a mesmerizing image of a moving slinky-esque echo of human waves. The company’s members while of diverse backgrounds, each respectively comes with an accomplished history of training and experience and this was notably ostensible here. Hubbard Street Dancers in Solo Echo by Crystal Pite: Jacqueline Burnett, far right with, clockwise from far left: Michael Gross, Florian Lochner, Kellie Epperheimer, Andrew Murdock, Jesse Bechard, foreground, and Emilie Leriche. Photo by Todd Rosenberg. Each of the 5 works in the evening’s program of music and dance collaboration was quite distinctive, underscoring the multi-faceted nature and broad artistic range of the dance company. To this viewer, Hubbard Street Dance Chicago demonstrated why it’s among the forefront of contemporary dance both in the U.S. and abroad.